Future Corporation supply latest equipment & accessories available in the world today for your digital llife.Future Corporation is your source for hard to find cables & connectors, office organizers and many others modern life requirments. 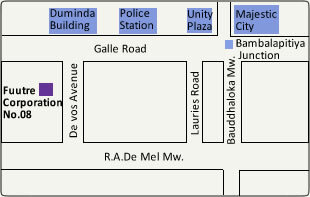 We have our main office & warehouse at No 8 , De vos Avenue, Colombo 4. We hope to appoint many franchise outlets at different places in the island to distribute 'Future Corporation ' products.